James Gandolfini heart attack: Was obesity or smoking more likely the cause? That didn’t necessarily kill him. Actor James Gandolfini died Wednesday of an apparent heart attack. A Gawker requiem praised him for changing the way fat characters are portrayed in pop culture. But it added, “Let’s be honest, even if tomorrow an official report comes out of the hospital in Rome saying it wasn’t a heart attack, James Gandolfini died of obesity.” ABC News also used his death to highlight heart attack risks. 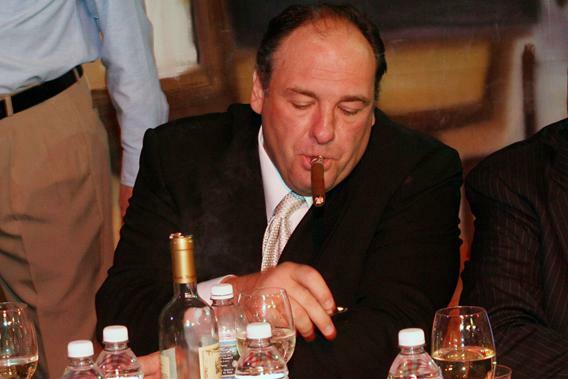 However, Gandolfini was also a cigar smoker. As Daniel Engber pointed out in 2012, and as research since then has emphasized, the health risk from smoking is much, much greater than the risk from obesity. Engber’s original article is below. Which is a more serious problem for America, smoking or overeating? According to a Gallup poll released this week, 67 percent of the nation’s adults think of cigarettes as an “extremely serious” or “very serious” social problem, compared with 81 percent who say the same for obesity. Gallup first started asking this question in 2003, and now, for the first time, respondents have shown that they’re more worried about jiggly thighs than blackened lungs. The idea seems to have made its way to Wall Street and Washington, too. Just this week, a group of equity strategists from Bank of America and Merrill Lynch proclaimed that “global obesity is a mega-investment theme for the next 25 years and beyond,” and the Food and Drug Administration approved a weight-loss drug for the second time in two months—having finally calmed its nerves after the deadly fen-phen scandal of the late 1990s. The shift in public opinion suggests a dangerous and unintended consequence of the war on obesity. Years of epidemiological work have shown that smoking is far worse for your health than being fat. So much worse, in fact, that any suggestion to the contrary should be taken as a sign that our priorities are getting all mixed up. Fat is correlated with ill health, of course, and the one-third of the U.S. population who qualify as obese may be subject to some very real and severe consequences. An obese person is up to twice as likely to die of any given cause than someone whose body mass index is in the normal range, controlling for other factors. In medical terms, we would say that his or her relative risk of all-cause mortality is between 1 and 2. What about smoking? The analogous number for those who consume at least one pack of cigarettes per day is 3.7, meaning that heavy smokers are almost four times more likely to perish than nonsmokers, about double the risk associated with obesity. Estimates of avoidable deaths reflect this difference in the odds: According to the U.S. Centers for Disease Control and Prevention, smoking accounts for an excess mortality of more than 400,000 Americans every year, compared to just 112,000 for obesity. That’s despite the fact that there are many more fat Americans—obesity rates are now 50 percent higher than smoking rates. These numbers are just for the extremes. Even at the shallow end of the pool, smokers are at greater risk. If we limit the analysis to light tobacco users—those who consume a handful of cigarettes per day—then the relative risk of mortality turns up at 1.5, roughly the same as it would be for people with full-blown obesity. What about the folks who aren’t huge but merely overweight? CDC research suggests they have a relative risk of less than 1, in which case carrying a bit of extra weight could even provide some kind of protective effect on your health. Yet this disparity in outcomes has become ever harder for the public to grasp. The intensifying rhetoric about obesity—from the White House, from HBO, from Michael Bloomberg—has obscured some truisms of the war on smoking. The Gallup poll tells us that Americans are 20 percent more likely to label obesity as a grave social problem, a national misconception that’s only made more dispiriting by recent news on the tendency of those who quit smoking to gain weight. For a paper published last week, researchers in France and England reviewed the data from more than 60 studies of this effect. It’s long been known that tobacco keeps you thin: Nicotine increases metabolism while suppressing appetite. But these factors have a greater effect than was previously thought. In the year after people quit smoking cigarettes, they gain about 10 pounds on average. It’s telling that the prospect of gaining a few pounds can lead to the resumption of such a deadly behavior. The marginal health risk of this shift on the BMI scales is slight or nonexistent, but the social stigma is more severe. That’s why spurious weight concerns are among the most common reasons why women quit using birth-control pills and put themselves at risk for unwanted pregnancies and all the complications (including weight gain) that come with it. Discrimination against fat people has real effects, too, in terms of income, quality of health care, relationship status, and even rates of heart disease and diabetes. Some of the respondents in the Gallup poll may be well aware that smoking is the deadlier problem. It’s possible they’re more concerned about obesity than smoking because they know that smoking rates have dropped in recent decades, while obesity rates are increasing or at best leveling off. But if we could reduce the number of smokers by another five or 10 percentage points, it might yield the same net improvement for public health as the invention of a magic pill that could turn every fat person thin. It’s remarkable, when you think about it, that the war on smoking has been as successful as it has been, considering all the superficial excuses there are to maintain the habit. Nicotine is addictive in a way that food, as a category, isn’t. Smoking is less shameful for most people than overeating, and it keeps you thin. There’s evidence that it prevents teenagers from getting acne—one recent study found a dose-dependent, inverse relationship with cigarette consumption among a sample of 27,000 soldiers in the Israeli army—and that men who quit smoking experience rapid drops in testosterone. In other words (as we all suspected) tobacco use can improve your social status. The fact that we’ve managed to cut smoking rates in spite of these factors doesn’t make tobacco any less of a scourge, or obesity any more dangerous in comparison. If anything, the paradox suggests that stigma is not in itself a solution to social ills. If Americans are more worried about obesity than smoking, it’s because they’ve let the shame of being fat cloud their judgment with second-hand smoke.